Over the last three decades, China has had a phenomenal growth rate. Local businesses in the non-sector as well as joint ventures and businesses controlled by overseas investors are thriving. Furthermore, the growing influx of foreign investment in China, albeit temporarily slowed by the global economic crises, drives an increasing demand for international managers with the specific capabilities required to manage in this culturally and institutionally distant market. This book proposes a framework for developing expatriate managers' local competence in the Chinese market from a knowledge-based perspective. Also discussed are the determinants of bank loans to manufacturing firms in southern China. As state-owned commercial banks dominate the Chinese banking sector, it is postulated that the local and central government influence the loan activities of these banks. This book also examines the country image and product image of Chinese products from Japanese consumers' perspectives. Strategic implications are developed regarding how Chinese enterprises should improve their product image when entering world markets, especially developed country markets like Japan. 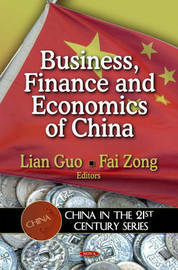 Other chapters provide an overview of the business environment for SMEs (small and medium-sized enterprises) in the People's Republic of China. Possible sources of competitive advantages that are unique to Chinese SMEs are analysed, mainly from a resource-based viewpoint. In addition, political factors, labour costs, internal and external factors for Chinese SMEs are analysed and summarised.